Although I am seriously romantic, I am not terribly interested in the flurry of gas-station roses and GMO candy that marks February 14 as Valentine’s Day. 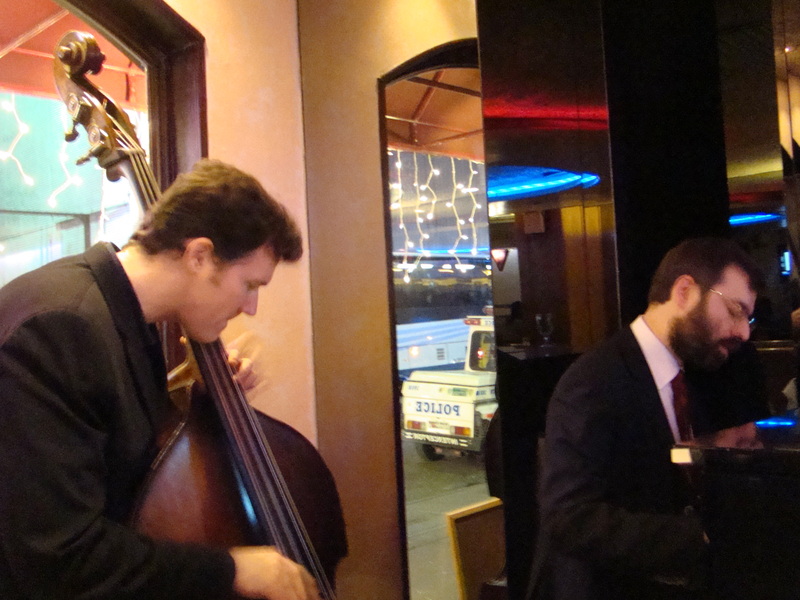 But I do love MY FUNNY VALENTINE, and I thought it very sweetly appropriate that pianist Larry Ham, bassist Chris Haney, and drummer Klaus Suonsaari played it at Sofia’s several nights before it would be the anthem du jour. Here is their soulful rendition, with Larry’s fascinating harmonies reminding me of Jimmy Rowles; Chris spinning quietly eloquent lines; Klaus making those wire brushes whisper and cajole. Great music for romantics any day in the year! Song scholars will know this, but MY FUNNY VALENTINE was originally performed in the Rodgers and Hart musical BABES IN ARMS . . . sung to “Val,” or Valentine — by the young woman who cheerfully enumerates his flaws but wants him to keep them. I didn’t know that “Valentine” was originally played by Ray Heatherton, famous in my time as someone appearing on children’s records and later as the MC of the Long Island, New York BREAKFAST CLUB. If only I had known about his past lives when I encountered him in 1974, I could have asked him . . . This one’s for the Beloved, who occupies the position of Valentine so securely that I cancelled any other auditions shortly after we met . . .
Harold Ross, who edited THE NEW YORKER, once wrote, “Talent doesn’t care where it resides.” I think of jazz improvisation as a secret beautiful art. Although the players are happy to have a receptive audience, often the audience’s inattention matters not at all, for the players are creating something that we happen to eavesdrop on. This was the feeling that the Beloved and I had listening to pianist Rossano Sportiello and string bassist Neal Miner last Wednesday, Jan. 25, 2012, at Sofia’s Ristorante (211 West 46th Street). I had originally entertained thoughts of going there as a civilian — an ordinary listener with nothing more complicated in his hands than his drink, but the music was so quietly eloquent that I started videotaping and then asked permission of Rossano and Neal when they took a breather. Photograph by Lorna Sass. All rights reserved. Copyright 2012. Listening to Rossano, one hears his delicate touch, his rhythms (romping or subtle), his orchestral sense of the piano balanced with crystal-clear lines, his unerring ear for what Coleman Hawkins called “the choice notes.” And Neal Miner embodies swinging persuasiveness. Bass players usually get less attention than people with shiny horns. Understandable in a way: the bass is in the lowest register and it stands to the rear of the background. But the horn players I know admire the shape and scope of Neal’s lines and would be delighted to have invented them. Talent, taking up temporary residence on 46th Street. Beauty in the corner. Much to be thankful for.